There are four of us, we mourned the closure of the wonderful original Darth Maul Estrogen Brigade (DMEB-1), and thought to set up a successor. This is the result of our efforts. We divide the work between ourselves, but we can always be reached through the addresses below as well as through Private Messages on the DMEB-2 Boards. Webmistress: For general inquiries and requests that dont fit anyplace else. Archivist: To submit a story or any questions/problems related to our fan-fiction archive. Challenge: For information or questions about any of the fan-fiction challenge series. Team: To report any problems with the web site or missing links, etc. 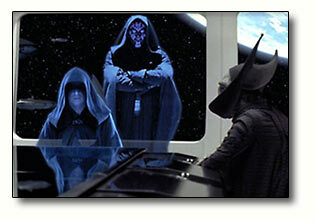 Sith Council: To contact us personally and any legal matters regarding the site itself. Gate-Keeper: For all Mailing List inquiries. Links Master: To tell us about any Darth Maul or Star Wars links you would like to share.